Inequality has been a hot topic in the last few years, particularly stemming from the Occupy movement & the subsequent coining of the term (or sociological class) “the 1%”. Since the release of Thomas Piketty’s Capital in the 21st Century, which describes the tendency of disproportionately accumulated wealth to continue accumulating, the debate has only intensified. Davies posits that society’s problems have arisen by competition becoming the de facto way of life outside of financial/corporate markets. A society that is constantly striving to distinguish the “best” things ends up creating a wide swath of “losers”. The divergence from a level playing field began in the late seventies, with government policies providing competitive advantages for companies. 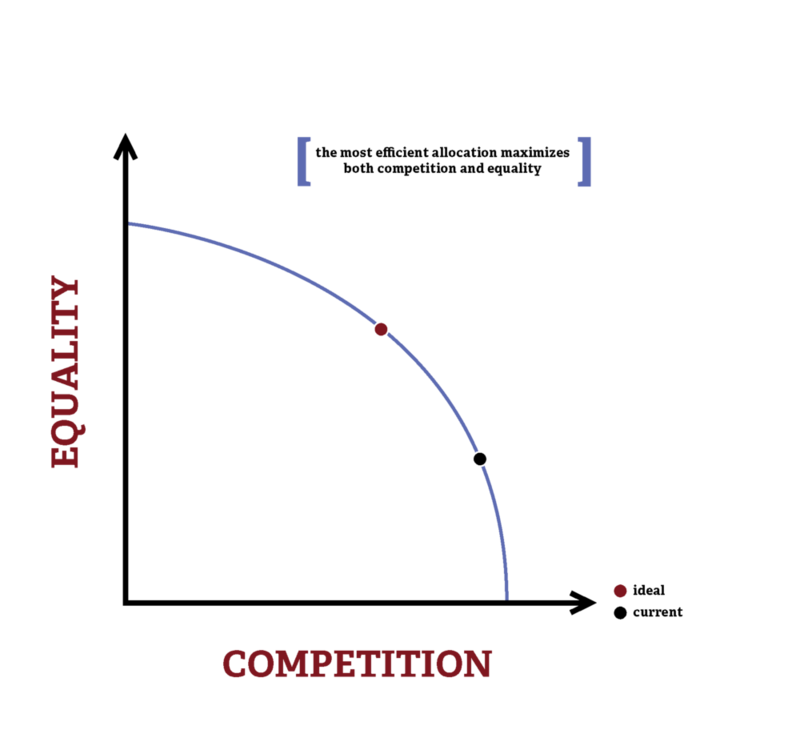 The promotion of competition is described as the “neoliberal” ideology, and stems from economists in the 1930s. Government policies have succeeded in creating a climate conducive to business, but the benefits companies enjoy have not been transferred to consumers. This particularly comes in the form of companies failing to provide a living wage for their workers. An example I take particular offense to: the amount of public assistance Wal-Mart employees receive, an estimated $6.2 billion dollars. The shareholders and owners of Wal-Mart enjoy the spoils of one of the most profitable companies in the world, while taxpayers carry the burden of providing Wal-Mart employees with basic standards of living. It should stand as obvious that the distribution of corporate profits & salaries is far from equal—which isn’t a huge issue until it translates into an unequal playing field for the next generations. Competition becomes ugly once “equality of opportunity” ceases to exist. The primary issue of concern here is education, which is in my opinion the foundation upon which America’s problems rest. We are obsessed with the idea of the “American Dream”—that hard work and dedication can allow anyone, yes anyone¸ to be a success and live a pleasant life. Countless factors have contributed to the extinction of this dream, but the problem has become quite clear as college has become the de facto outcome for any young person hoping to be successful (i.e., a “winner). Competition for college entrance has intensified, and in this playing field advantages do not simply come from raw brain power, but arise from years of education and training (think private school, tutors, SAT prep) contingent upon money. As public schools are funded by property taxes, low-income areas typically have poorly funded schools, which translate to students highly unlikely to reach college, let alone the best colleges. How do we level the playing field? Educational opportunity will never be perfectly equal, as there will continue to be varying levels of income and the advantages or disadvantages that brings. However, it is entirely possible to provide nurturing and education of a high caliber to all students, so that bright minds from any tax bracket may thrive. Countries such as Finland and South Korea are examples of universally excellent education. College should not be the end-all-be-all for everyone, as some are simply more suited to mechanical trades or manual labor. Society would cease to function without blue-collar workers, and the basic standard of living they experience should reflect that. Where does the perfect level of competition vs equality lie? Looking at a production possibilities frontier, which outlines all potential levels of competition vs. equality, we can see the most efficient outcome lies somewhere between our current state and a more equitable society. We can also measure our level of inequality through metrics such as the Gini Index. Davies highlights some questions that stem from the very value we place on humans. To eliminate our society’s competitive nature seems virtually impossible, yet mounting anger and frustration with the current state of affairs will almost certainly lead to major societal changes. While I am personally under the belief that a certain degree of competition adds value to society, Davies certainly creates food for thought and reminds us to find value in people and things regardless of if they are the “best”. Our society began structuring competition as a positive framework to derive the best outcomes. The government spent years creating policies to enhance competition and corporate success (free markets! ), but they haven’t transmitted to equitable standards of living for employees. This issue was highlighted as education simultaneously became dependent on income, thus limiting upward mobility. At this point, the competitive structure of society ceased to be upon any semblance of a level playing field.